One of those sessions focused on AI & Computer Systems. Co-organized by EcoCloud Director Babak Falsafi and PhD Student Mario Drumond, the session began with a presentation on ‘Value-Based Deep Learning Hardware Acceleration’ by University of Toronto Professor Andreas Moshovosby. He has worked extensively on designs that offer a range of effective choices in terms of area cost, energy efficiency, and relative performance when embedded in server class installations. The next talk on ‘Catapult and Brainwave: Powering Microsoft’s Configurable Intelligent Cloud’ was delivered by Michael Papamichael, Researcher in the Microsoft Research ‘Project Catapult,’ an enterprise-level initiative in cloud computing. The third speaker was Hadi Esmaeilzadeh, professor at the University of California, San Diego, and currently involved in developing new technologies and cross-stack solutions to build the next generation computer systems. Thereafter, the three speakers participated in a panel discussion on their research themes. The penultimate speaker of the session was Kevin Smeyers, Evolutionary Architect at ToThePoint. His paper titled ‘ToTheArcade: IoT and Machine Learning, a match made in heaven, a gamified PoC’ presented his experiments in combining machine learning with IoT. The session concluded with a presentation by IBM Developer Advocate Svetlana Levitan on ‘Defending deep learning from adversarial attacks.’ She has been at the forefront of many statistical and machine learning implementations and is currently representing IBM in the Data Mining Group. 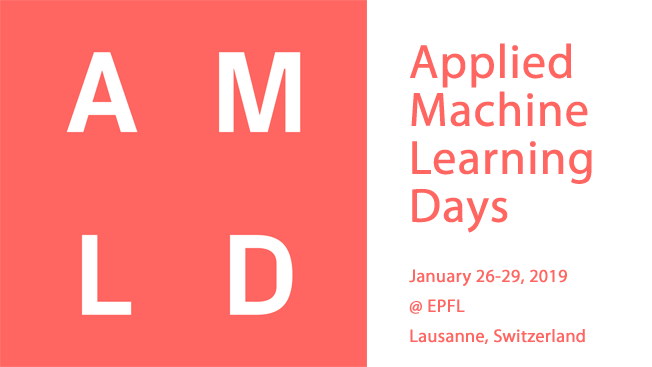 The AI & Computer Systems track brought to the fore many new findings in the interplay between computers and Artificial Intelligence and, together with the other domain tracks at AMLD2019, redeemed the pledge of a dedicated organizational team at EPFL to push further in the realm of machine learning.